Anafi lies 22km east of Santorini, a tiny island perched on a distant horizon, with a slow-paced traditional lifestyle and striking Cycladic landscapes. Greece holidays in Anafi Island, drenched in dazzling light, exotic, with a wild yet serene nature, Anafi, untouched by mass tourism, is an alternative and enchanting holiday proposition. It is said to have emerged from the angry waves at the command of the god Apollo and was a refuge for the sea-weary Argonauts. Today, Anafi, the child of music, is a haven for its few residents and visitors seeking an intimacy with nature at its most unspoilt. Even the most seasoned traveller will find one-of-a-kind relaxation and reflection in plentiful supply. Anafi island has no airport. The closest airport is located in Santorini, the top Greek destination. The airport of Santorini is busy during the entire tourist season. It receives regular internal flights from Athens and Thessaloniki and many charters and direct flights from abroad. The flight from Athens to Santorini lasts 40 minutes. Then, visitors can continue to Anafi by ferry from Santorini that takes about 2 hours. Virginal beaches, footpaths, majestic hills, chapels, buildings displaying the skills of local craftspeople and interesting archaeological sites will offer you unique, exciting moments in this land where people follow a simple lifestyle, harmoniously combining tradition with the modern day. Modest and quiet compared to its cosmopolitan Cycladic neighbours, Anafi exudes an inherent confidence in its subtle charms; definitely a case of love at first sight. You will be taking every opportunity to look at boat itineraries from Piraeus or Santorini to get more of the mental and spiritual catharsis, which just being on the island can induce. Amphitheatrically built upon the ruins of the Venetian castle, 3 km from the harbor of Agios Nikolaos, the Hora of the island quite literally sparkles. You will wander its narrow alleys, impressed by its distinctive Aegean architecture and calmed by its relaxed, leisurely pace. Little whitewashed houses and gardens in full bloom will remind you of Anafiotica, the neighbourhood under the Acropolis of Athens, built by highly skilled craftsmen from Anafi. Enjoy the limitless view to the sea and lose yourself in romantic musings at sunset against the backdrop of the two windmills on the hillside. The highest monolith in the eastern Mediterranean, Kalamos, is at the eastern end of the island and it constitutes its most impressive natural sight. “The most terrifying rock in the world”, according to a 18th century French traveler, is particularly popular with experienced rappellers and climbers. A part of Kalamos is the cave of Dracontospilo which can be reached only by footpath. It is a fascinating spectacle festooned with stalactites and stalagmites. From there you may spot a school of seals which, according to the locals, make frequent appearances in the area. It is at the top of Kalamos, at the end of a path starting from the Monastery of Zoothohos Pigi (Kato Panagia), at an altitude of 460m. While ascending, admire the rugged, imposing landscapes accompanied by the caws of the hawks and the gentle whistle of the wind. On reaching the summit, you’ll be awestruck at the sight of the elegant Holy Temple of Panagia with its white dome and bell tower, not to mention the breathless blue of the sea and the sky uniting on the fine thread of the horizon. With their wild beauty and crystal clear waters, the beaches of Anafi offer a transfixing, crowd-free experience. Endless hours of fun and relaxation are at your disposal. On the south coast you will find the sandy shores of Agios Nikolaos, Katsouni, and Klisidi. You can also swim in the turquoise waters of the famous endless beach of Roukounas, with its peebly sand and tamaris, or the magnificent gold coasts of Flamourou and Prasies. Clinging to the craggy northern coast of the island is the chapel of Agios Antonios with the eye-catching double arch on its roof. In the only Byzantine temple of the island, you will see frescos of Candlemas, the Ascension and Nativity dating from the early 14th century. Circumnavigating Anafi by boat will allow you to discover beaches, difficult or even impossible to access by road. Passing by Kalamos, with its towering, vertical rocks, will certainly be the standout moment. 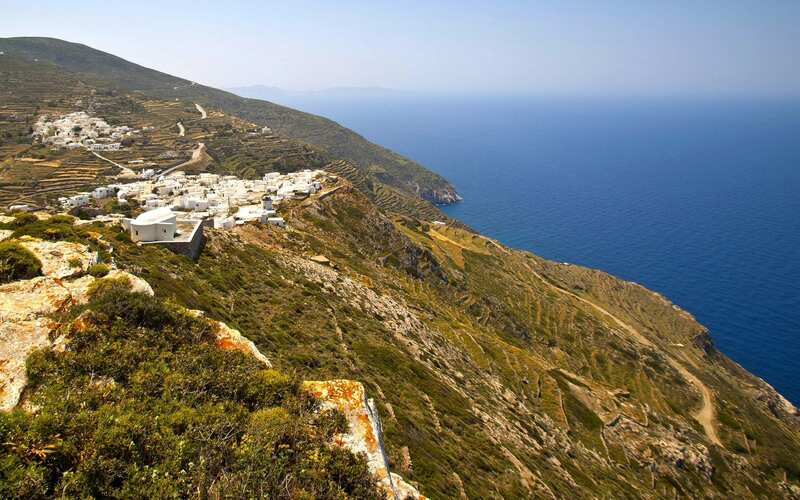 Well-kept rented rooms and hotels will cover your accommodation needs on the Anafi island. As for food, you will have your fill of fresh fish and dishes infused with the distinctive aroma of crocus that grows on the island. Do not miss out on the opportunity to try sweets made with mouthwatering local honey.